Nov. 24, 2017 9:30 a.m. If an octopus can pick the World Cup winner and groundhogs can predict the weather, then maybe a giant panda has the inside line on the Grey Cup. 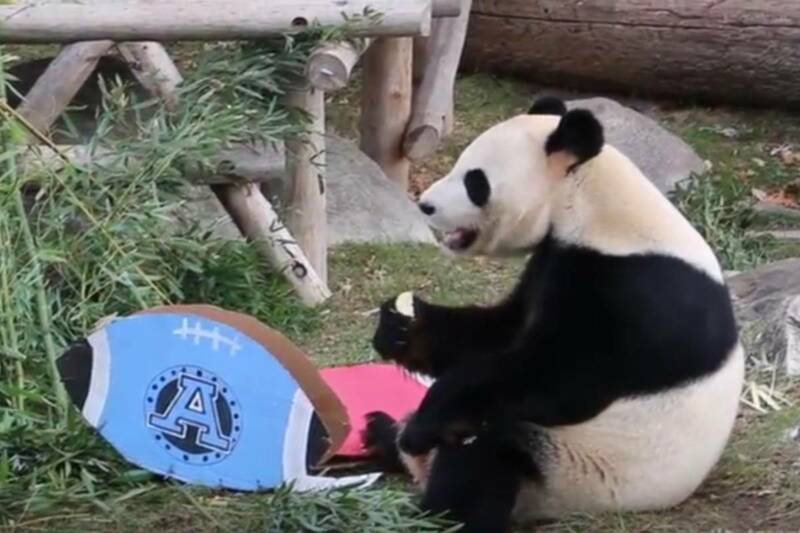 As fans gather for Sunday’s game in Ottawa, the Toronto Zoo let a panda make its choice for the winner of the matchup between the Toronto Argonauts and the Calgary Stampeders. Two cardboard footballs marked with the team logos and filled with “yummy treats” were placed in the panda enclosure at the zoo. Keepers said the football the panda eats from first would be his prediction for the winner. Da Mao first pawed at the Calgary football, knocking it over, and then moved on to the Toronto football and began munching the panda treats inside.